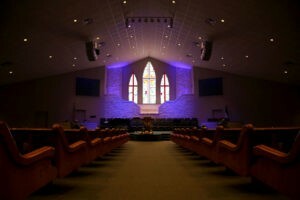 Taylor’s Valley Baptist Church (TVBC) is first and foremost a place of Christian worship and we view the marriage ceremony an extension and integral part of such worship. We believe that marriage is a holy and sacred gift from God. Therefore, it is our desire that couples approach marriage according to Biblical standards and in a way that is pleasing to God. The policies and procedures state the requirements of TVBC in order for a wedding ceremony to be approved for our campus. All weddings must be approved by the Pastor in coordination with the Facility Host. The congregation at Taylor’s Valley Baptist Church sincerely holds the religious belief that a marriage is designed by God to be between one man and one woman uniting together as husband and wife as described in Holy Scripture. We therefore oppose providing services, accommodations, facilities, goods, or privileges for a purpose related to the solemnization, formation, or celebration of any marriage outside this specific belief. Malachi 2:14 … It is because the Lord is the witness between you and the wife of your youth. You have been unfaithful to her, though she is your partner, the wife of your marriage covenant. Genesis 2:22-24 And the rib, which the LORD God had taken from man, made he a woman, and brought her unto the man. And Adam said, This is now bone of my bones, and flesh of my flesh: she shall be called Woman, because she was taken out of Man. Therefore shall a man leave his father and his mother, and shall cleave unto his wife: and they shall be one flesh. 1 Corinthians 7:2 . . . let every man have his own wife, and let every woman have her own husband. 2 Corinthians 6:14 Do not be yoked together with unbelievers. Our policy on remarriage after divorce – Our pastors are under no obligation to officiate the marriage ceremony of anyone, but we are open to counsel to those who choose to marry. Each situation will be treated individually, compassionately, and redemptively. No remarriages after divorce will be performed if there is a possibility of reconciliation with either person. No remarriages after divorce will be performed until at least one year from the date the divorce is final. Our policy on sexual relations prior to marriage – Legitimate sexual relations are exercised solely within marriage. In our view, premarital sexual activity is a serious breach of Biblical ethics regardless of the norms of behavior in our secular society. (See Genesis 2:23-24; I Corinthians 7:1-9) Such an ongoing sexual relationship raises questions about a couple’s sincerity to enter into a solemn covenant with God as described previously. Couples should cease sexual relations and cohabitation until their wedding date. To secure a date for your wedding on TVBC’s calendar, a completed application with a security deposit of $500 must be submitted to the church office. A date/reservation is not officially confirmed until the church office contacts you verifying the date. Written and verbal confirmation of the approval will be provided to you. Please do not have invitations printed until the church office has confirmed the date/reservation. An incomplete application will delay processing and confirmation of your desired date. no later than 30 days prior to requested date. No weddings on Sundays or holidays. Wedding rehearsal will be held from 6:30 pm until 7:30 pm the day before the wedding. Note: one hour time limit. The outstanding balance must be paid no later than 30 days prior to the date of the wedding. The security deposit will be returned within 30 days after the wedding if, upon inspection, there has been no damage to the facility or equipment and there has been no violation of our policies. Violations of the food/drink in Sanctuary rule will result in penalties deducted from the security deposit. Fees paid to Minister performing the service and providing counseling services are to be paid directly to the individual Minister. We recommend a minimum fee of $300. Reception facilities are available for established, currently active members only. Fees for the Sanctuary, Fellowship Hall and Outdoor Areas are waived for established, currently active members and their immediate family. are attending regularly or have attended regularly for an extended period. “Immediate family” is defined as parents, children and grandchildren. Visit our website at www.tvbc.net and check the calendar for available dates. Schedule a preview with TVBC Facility Host to preview facilities and review wedding policies. Complete an application and submit a deposit of $500 to the church office. Church office will confirm the date of the wedding. Complete pre-marital counseling with a TVBC pastor or one approved by TVBC staff. Pay balance of wedding fees. Have music selections approved by TVBC Minister of Music. Provide all media to Facility Host one week prior to wedding day to ensure compatibility with equipment. Wedding decoration (if any) and rehearsal. Restore facilities immediately after ceremony. Yes, before you leave for the reception. Facilities reviewed by Facility Host. Deposit returned upon Facility Host approval. All couples to be married by the Pastor must schedule and attend at least three (3) counseling sessions before the wedding. Counseling appointments are to be made through the church office. During the course of the counseling sessions, the Pastor may make a decision that the couple does not meet the criteria to use the TVBC facilities for their wedding and cancel the wedding reservation. Email connect@tvbc.net to request a counseling appointment with the pastor. If a guest minister is to conduct the service, the guest minister must contact the Pastor no later than one month prior to the date of the ceremony and supply a copy of the service to be conducted for approval. Guest ministers must meet the approval of the Pastor. The Pastor may grant permission for a judge to perform the marriage if the judge is a family member of the wedding party. 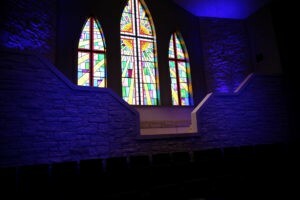 The Facility Host for the church will serve as the primary contact person for your wedding experience in our church. secure the building after the rehearsal and wedding. The Facility Host will not assist with decorations, run errands or assist with the administration of the ceremony. It is strongly advised that a wedding coordinator be hired by the wedding party in order to properly administer the event. Your wedding is a sacred celebration. It is expected that you will select appropriate music for the service. Submit all musical selections whether recorded or to be performed live to the Facility Host for the Minister of Music’s review and approval. Audio and video systems may only be operated by technicians provided by TVBC. No exceptions. The technicians will attend the rehearsal to plan cues. All media to be used must be provided one week prior to the wedding. Our equipment is Windows based and accepts wma, mov, mp3, video dvd, and audio cd. State Law requires that the marriage license be obtained at least 72 hours prior to the date of the wedding. The license should be given to the Pastor or Minister at the wedding rehearsal. The Pastor or Minister will be responsible for filing the license with the appropriate legal authorities after the ceremony. The Facility Host will be on-site all the time when the facilities are open. The facilities will be open up to eight hours the day prior to the wedding for decorating and rehearsal. The hours, however, may be split. The facilities will be open up to ten hours the day of the wedding for wedding preparations, wedding and restoration. Additional time will incur charges of $20 per hour for the Facility Host and will be deducted from the deposit. No flash photography may be taken during the ceremony without prior permission of the Pastor or Minister performing the ceremony. Decorating may be done either the wedding day or the prior day. Schedule with the Facility Host. TVBC does not have or supply any wedding decorations. The wedding party must supply all decorations. All decorations must be removed and all church furnishings must be returned to their appropriate locations by the wedding party within two hours after the ceremony so that the cleaning crew will be able to clean and prepare the facilities for regular services. The wedding party is not responsible for returning the musical instruments, podium or platform to their locations. The custodian does not clean the kitchen or wash dishes. This is the responsibility of the wedding party. The wedding party is responsible for conveying any and all of these policies to their florist, and/or anyone responsible for decorating the facility. Place protective coverings under all flower containers. No flower container may be placed on any musical instrument. Rearrangement or removal of furniture, fixtures, promotional material, signs, or other such program materials must be requested and approved in advance. The wedding party is responsible for moving and restoring all such items. No decorations may be placed on woodwork or walls. No adhesives (including tape), nails, clamps, screws, staples or other items may be used on any surface. Decorations may be draped over or placed next to pews but not attached to the pews in any manner. Only ‘dripless’ candles or votives may be used. A mat of clear plastic must be placed under any candelabras. In the event of wax drippings, the wedding party shall be liable for any damages. Prior approval from the Facility Host must be obtained for outdoor decorations, signs or other materials. Live animals whether caged or not. The Facility Host may restrict or prohibit the use of any item in his/her sole discretion without specifying a reason. Silk flower petals may be used in decorating the church or strewn down the aisle. However, they are considered decorations and must be removed by the wedding party in the time allotted. Tobacco products, alcoholic beverages, illegal drugs and similar items are prohibited from church property. TVBC is not responsible for lost, stolen, misplaced, abandoned or damaged items including rented decorations. No food or beverages are permitted in the sanctuary or foyer. Violations of this rule will result in a $100 penalty to be deducted from the security deposit. Further violations after warnings will result in additional penalties or cancellation of ceremony. A crying room is available in the back of the sanctuary. No children’s toys are allowed in the sanctuary. Rehearsal dinner and wedding reception facilities may be available for established, currently active members and their immediate families if scheduling permits. Decorations should be fully prepared prior to bringing them to the church. This facilitates a much shorter time needed for decorating the church. All live music should be fully rehearsed prior to the wedding rehearsal. Only a few bars should be played at the wedding rehearsal since time is quite limited.